"We believe that kayaking and fishing should be accessible, rewarding and- above all else-fun. This starts with locomotion. For many kayakers, long hours of paddling can dampen their fun factor, and paddle splashes can startle fish and wildlife. So we asked a hard question: why labor to pull with your arms when it's infinitely more efficient to push with your legs? Hobie's bio-engineered MirageDriveTM propulsion system for kayaks was revolutionary in its inception in 1997 and has been evolving ever since. Now comes the biggest advancement - so far. Introducing the Hobie MirageDrive M180 forward-reverse propulsion system featured in all 2017 model year Mirage kayaks. Weighing in at under eight pounds, the MirageDrive M180 produces full power in both directions and offers unprecedented maneuverability. The user can pull one of two shift cables to pivot the fins 180 degrees, almost instantly from forward to reverse and back again. The dual fins provide shallow water access and easy shore landings by simple pushing one pedal forward. Imagine the possibilities: backing fish out of cover; safely fishing closer to obstructions; or fishing downstream while holding in current. Hands-free propulsion in any direction means better control; to cast, to present baits, and to concentrate on landing bigger fish. Pictures can be snapped or cold beverage enjoyed on the way back in without ever stopping. The MirageDrive M180 continues to deliver on Hobie's legacy for snappy, reliable performance, confidence-inspiring power and all-day efficiency. But this is only one element of what makes kayaking and fishing, Hobie-style, so sweet. Vantage seats offer unparalleled adjustability for the utmost in comfort, a drier ride, and longer days on the water. They feature breathable 3D mesh that is cool, comfortable and supportive, minimizing pressure points, and BOA lumbar support to customize your experience. Our industry-leading seats are available in several configurations, each one maximized for its platform. Just pull the lever to adjust seat back recline, and pull a tab to adjust foward edge height. Just a pull of a handle and the kickstand will raise to back edge to have the seat at it's highest position. Just unsnap the seat and pop in four legs to have a chair shore-side. 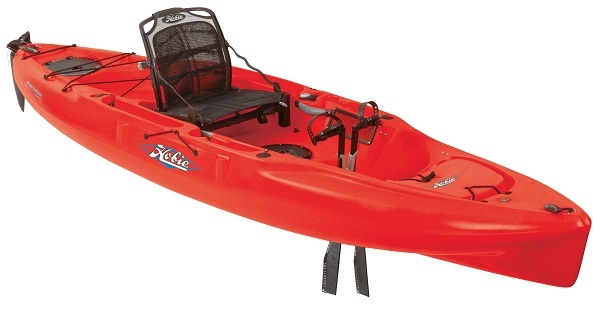 Here at Megrew´s Boats we stock a large supply of kayaks and parts for the Hobie Kayak community.